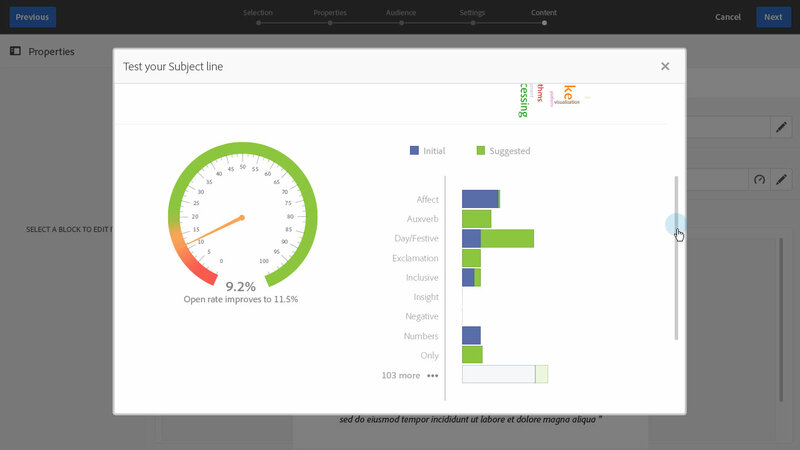 Adobe recently unveiled their plans to add an email insights feature to the Adobe Campaign platform. 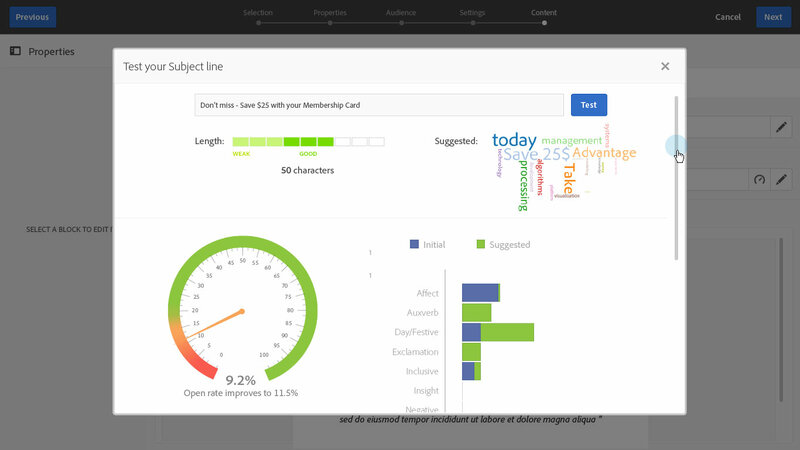 The new automated subject line capability predicts open rates for emails and recommends content for subject lines in order for marketers to improve email performance. The subject line prediction feature is able to automatically suggest specific words or adjectives. So, for example, a clothing retailer that is using predictive subject lines can opt to refer to its new spring-coloured ties as “brand new” instead of “new” and increase open rates that way. Below are some pictures of what the tool will look like, although the look of the final product may change as it will go in beta first. Click for large image. The suggestions are made by applying Data Science algorithms to data collected from previous subject line performance in Adobe Campaign. According to Adobe, the recommendations are based on customers’ own data. There is no sharing of data across customers. The advice is not based on the subscriber behaviour per list segment though, so it will be the same for a given subject line, but it is specific per industry. As a result of using the tool, emails sent are more in-tune with what customers are looking for. Adobe let us know that the feature is based on a proprietary algorithm created by Adobe research labs. Currently, there are tests performed and the algorithm will get better and better as the customer will be sending more campaigns. The tooling can also predict the number of opens for any given email subject line translated to an open rate. For instance, if any subject line can get a predicted open rate of 23%, that rate what would be shown in the interface. Predictive email subject lines is planned to be in beta for Adobe Campaign Standard customers in Q3 2016.